Today’s Last Monday Book is actually a series. 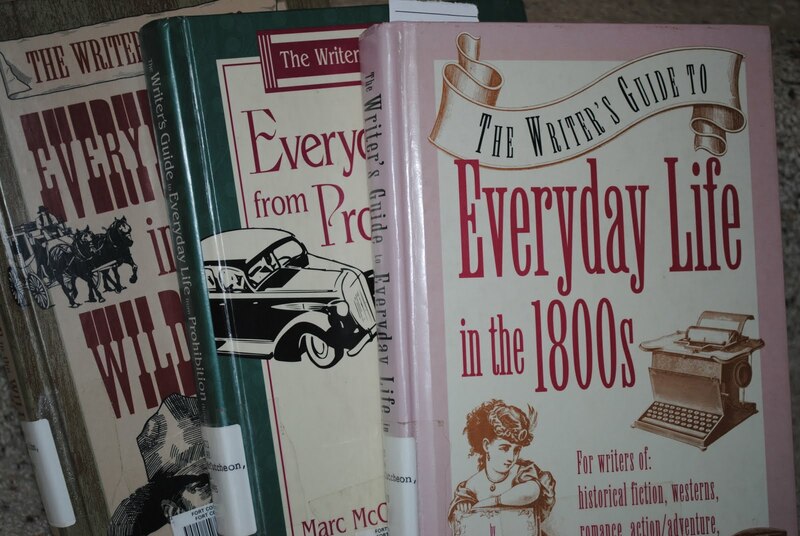 Those of you who write historical fiction are probably familiar with The Writer’s Guide to Everyday Life, but the books are a new discovery for me. These reference books compile the relevant cultural information of an era in one handy volume, as an infomercial might say. I love trivia, and these books are so full of fascinating information that they’re tremendous fun to browse through. I so want to have a character use the phrase “catawamptiously chawed up,” which meant utterly defeated in the American South from the 1840s on. Maybe that character would dress in a Benjamin (a loose topcoat worn by men when traveling) and ride in a Portland Cutter (the most popular sleigh following the Civil War, known for its ample leg room and low center of gravity). If he was lucky, he’d have spondulicks (money) in his pockets and a lovely young woman for sparking (courting). But, alas, she’d heartbroken to discover that he was a swartwouter (one who swindles and flees) who made off with all her father’s double eagles (twenty dollar gold pieces). I know I could find much of the same information contained in these books on the internet, but not without hours of surfing. And sometimes, I like to forego the computer entirely and do my research old-school at my kitchen table with a cup of tea. If you’re considering writing anything historical, or if you just want to brush up on your trivia to impress your friends and family, definitely give these books a look. My library offers the volumes about Renaissance England, Colonial America, the Middle Ages, Prohibition through WWII, Regency and Victorian England, the Wild West, and the aforementioned 1800s. Hopefully, your library has a similar selection. Oh, the typewriting machine (1843) beat the lock-stitch sewing machine by three years. Have you ever used a Writer’s Guide to Everyday Life for your research? Is the book peeking out from the others in the illustration: Everyday life in the 20s? Kay, that one is Prohibition through World War II. Not yet, but most likely will for future projects. Thanks for the tip! I did not know about these books and can think of three I want right now. Thanks for the tip! I do have the 1800s guide. I agree--so fun to flip through! I also have one of the "Fashionable Clothing from the Sears Catalog" books, which is available by decade. It's nice in that it's in color and also includes prices.